Forgotten Connections runs public workshops as well as working with groups and organisations on request. See sections below for the options and please contact constellations@forgottenconnections.org for more information on upcoming public events, private work and costs. 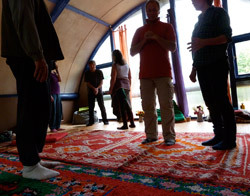 This is the ideal introductory workshop, bringing together the theory and the practice. It integrates the evidence about the consciousness of nature with the experience of connecting with it through Constellations to address whatever questions arise within the group. See the flyer here. This workshop can be run for the general public, or brought into specific organizations and communities wishing to explore the topics. Nature Constellations can be very versatile, both in terms of time and also meeting the needs of the group. While they are usually set up to answer specific questions held by an individual or organisation, they can also be done through simple structures for a group to explore. The shortest event run so far has been a half an hour slot in a festival situation, providing the thirty participants with a brief introduction, giving each of them the opportunity to have a direct experience, then space to reflect. For academic or other conferences, an hour or so slot during break-out sessions can give everyone the opportunity to have a short experience, or can focus on a question held by one participant. For more in-depth explorations by a few people, or a group wishing to co-create a question, then a day is ideal. This can allow for a number of separate constellations to be set up either on entirely different topics, or on a theme. Sometimes one constellation is not sufficient to address the complexity an organisation or project is facing. Or there could be a desire to do the work privately with chosen participants. Events can be tailored to meet these needs, as for example with an environmental organization that wished to explore the theme of connecting with nature with their founders and volunteers, rather than the general public. the most helpful treatments to support over-pruned olive trees. Ideally such in-depth work also allows time for the digestion of all that has been learned. Constellations work can be done in one-to-one sessions, either in person or via Skype. Through the course of an hour and a half, the facilitator would talk through the question to be addressed then support the inquirer to explore it experientially. Various methods, such as representing with objects or delineating areas in a room, can be used to tune into the parts of the relevant system as required.